OneDrop’s Ryosuke Kawamura grabbed his brother Yoshinori Kawamura (Fist Salud) for this quick video to promote the Rally, the plastic yoyo by OneDrop. 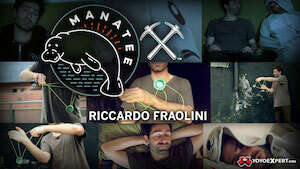 It’s a great quickie of a video, with some really nice trick construction. Slusny dropped a quick promo for the C3YoYoDesign Level.6, their newest budget metal yoyo, featuring C3YoYoDesign team member Tomas Bubak. If this quickie is any indication of what Tomas is up to lately, he’s going to put on a hell of a show at EYYC next month! 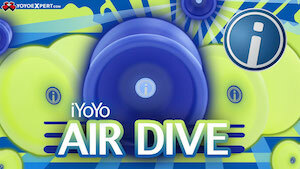 Yoyo used is the Slusny Edition Level.6 by C3YoYoDesign. Fist Salud put together a great video highlighting the talents of YoYoFactory’s Japan team and it’s absolutely jaw-dropping. Featuring John Ando, Atsushi Yamada, Takeshi Maruyama, and G­inji Miura. Yoyos used are the Loop 900, Loop 1080, Shutter, and Aviator. OneDrop’s Ryosuke Kawamura has dropped two more videos of up-and-coming Japanese players, featuring Ryo Miyauchi and Yuuya Yatani. Tons of great play in here…enjoy! The Fixed Axle February Video Contest is an artistic performance contest where the videos are judged on content, creativity, and entertainment/artistic value rather than trick skill. Anyone can enter, anyone can win. Full details can be found at www.facebook.com/FAF2014. NOTE: This is in no way related to our Fixed Friday columns, just something cool that we wanted to post! 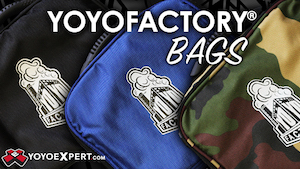 YoYoFactory’s Joe Wilson has a new video coming out later tonight showing off the recently released Aviator by YoYoFactory…but first he’s dropped some footage he’s been sitting on since before his VA States win last year. 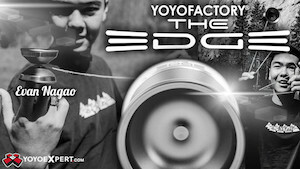 Using the YoYoFactory H.O.T., Joe drops some solid tricks and concepts that won him last year’s VA States and gives us a glimpse at what we can expect from his Aviator video tonight! 44FESTA started 2014 in style! The first FESTA of the year was held on January 18th, and included a New Year party for all attendees! As usual, 44FESTA is not just about playing, but also about enjoying yoyoing as a whole. This time, the exhibit booth had a very nice display case from Masanobu Iwata with the medals he won over the years in contests around the globe, including BAC, US Nationals and Worlds, each with the respective yo-yo used in the contest! That’s true dedication to the sport! The new generation continues to triumph over the veterans at the freestyle contest! Yamato Murata won his second 44FESTA freestyle contest in a row! Expect him to become a serious competitor very soon! You can check all freestyle videos on the 44FESTA page. And let’s not forget the party! The 44FESTA New Year party was a pretty relaxed pizza-burger-fries-nuggets time for everyone, and let’s be frank here: sharing a pizza at a yo-yo meeting is always a great time. That’s it for this edition! The next installment of 44FESTA will be on February 23rd, be sure to attend if you’re in Japan and go greet the legendary 44FESTA ducks! 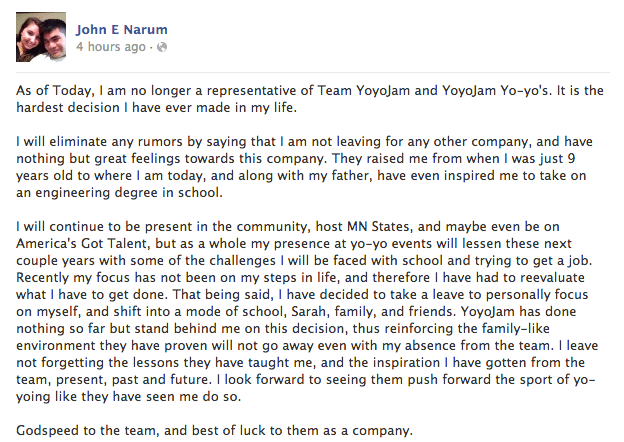 John Narum has announced his departure from Team YoYoJam. Nothing dramatic, and he’s not changing companies…just refocusing on the non-yoyo aspects of his life and stepping away from the responsibilities of being a competitive sponsored player. Congrats to John on this big step, and all our best! Rei Iwakura is, hands down, one of the most inventive and flawless yoyo players and performers in the world. If you think you’d like to argue that point I’ll save you the time: you’re wrong. The solo ham section that starts about a minute in to this video kicks off with a dead smooth solo ham fast mount, and escalates quickly to be some of the cleanest and best solo ham play I’ve ever seen. Huge thanks to YoYo Store Rewind for putting this video together! 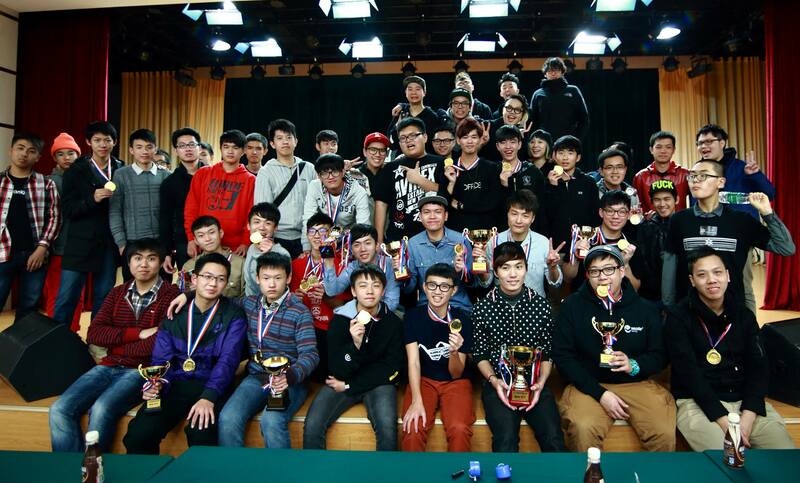 We’ve got the winning freestyles from the 2014 ShenZhen YoYo Contest, held last weekend in ShenZhen, China. Thanks to Jeremy from KingYoStar for getting these to us! In this great black-and-white video we get a solid look at yoyo contests of the 1950s and “World YoYo Champion” Art Pickles. I have to confess, I don’t really know much about Art Pickles. His name has come up a few times here and there in my various diggings into yoyo history, but I’ve never been able to find very much. He seems to be using and promoting an “off-brand” yoyo made by a company called Outspan, although I can also say I don’t really know anything about them either. 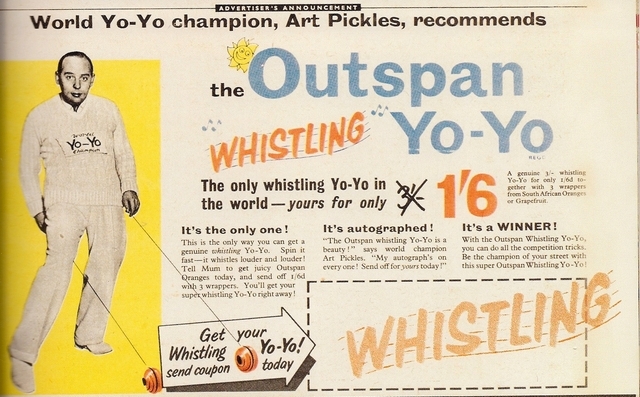 Art Pickles is an anomaly in yoyo history…he seems to have come and gone without leaving much of a trace, and doesn’t appear to have ever worked for any of the major companies of the day. But damn he was stylish…check out those double Walk The Dogs! 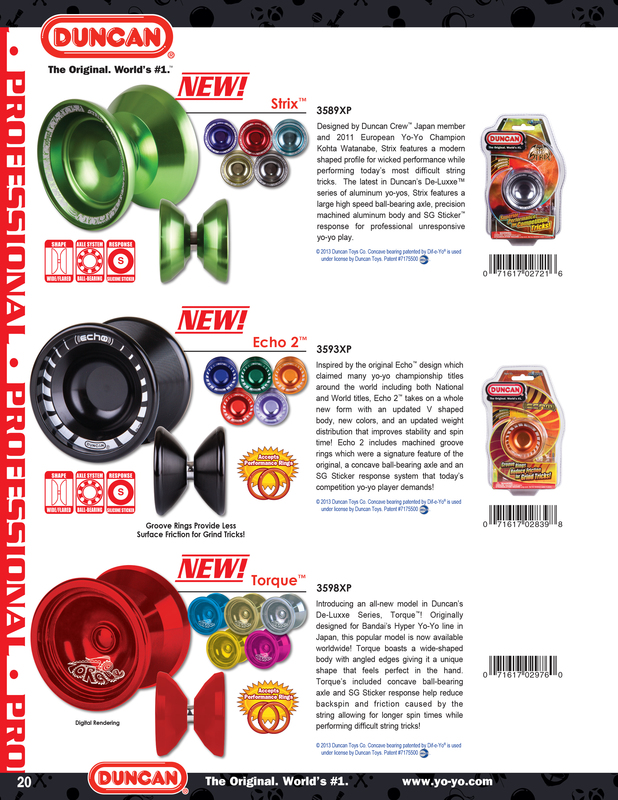 The 2014 International Toy Fair in New York City is just around the corner, and that means plenty of new products from the top yoyo manufacturers! Our first Toy Fair preview of the year comes from Duncan Toys, who has a surprising number of new releases slated for the year. Although the cover of their catalog features a huge logo for their 85th Anniversary, they don’t seem to be releasing any anniversary-themed products, and don’t make any mention of any anniversary events or releases. I don’t think we’ll be seeing any actual anniversary promotions from Duncan this year, especially now that Sales & Marketing Coordinator Brandon Jackson has moved down to Orlando to manage Duncan’s Disney retail cart and partnership. Duncan Toys looks to be short-handed at the moment, so if you ever wanted to work in the yoyo industry and live in rural Ohio…here’s your chance! 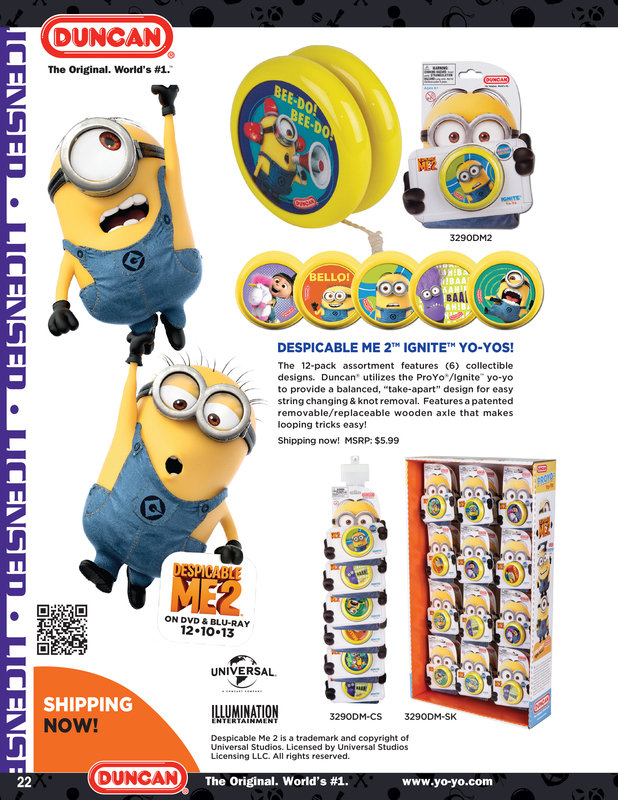 First up…licensed Ignite yoyos for Despicable Me 2! The Ignite has Brake Pad response and a replaceable wooden axle sleeve that you can easily swap out for the bearing assembly from a Duncan BumbleBee. All five designs are in Toys R Us stores across the US now and retail for only $5.99, and Despicable Me 2 (which is a great movie, by the way) has been out on DVD and Blu-Ray since December 2013, so you probably have it already. Or you should. Really, it’s great. 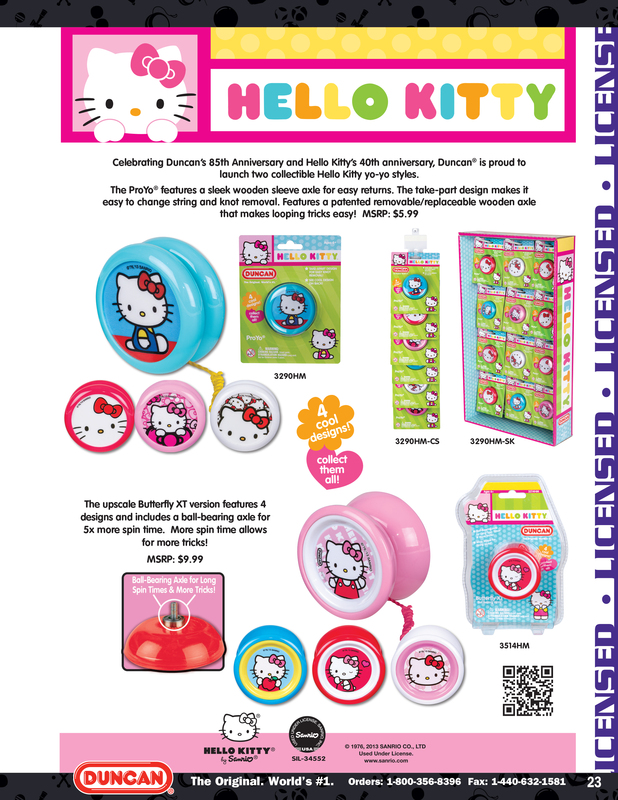 Next up we have the Hello Kitty yoyos that we first reported on last July. There are two models available, a ProYo and a Butterfly XT, each model with four different designs. These don’t seem to be shipping yet, but the ProYo version will retail for $5.99 and the Butterfly XT will retail for $9.99. Expect to see these in mass market outlets in the spring, if not sooner! 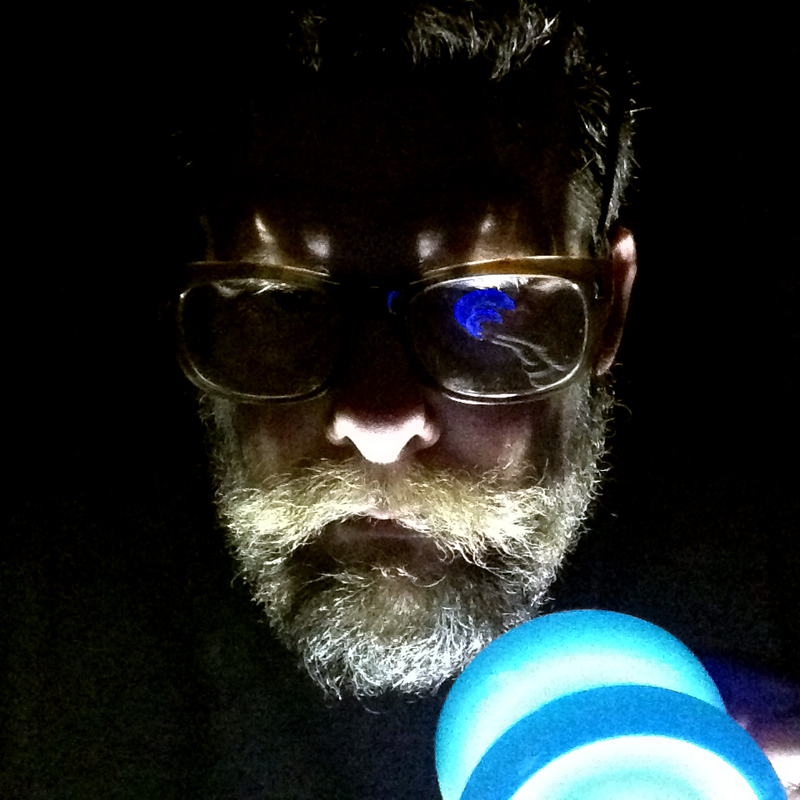 Duncan jumped in the kendama game last fall with the release of their Komodo kendamas, first shown on YoYoNews last July. 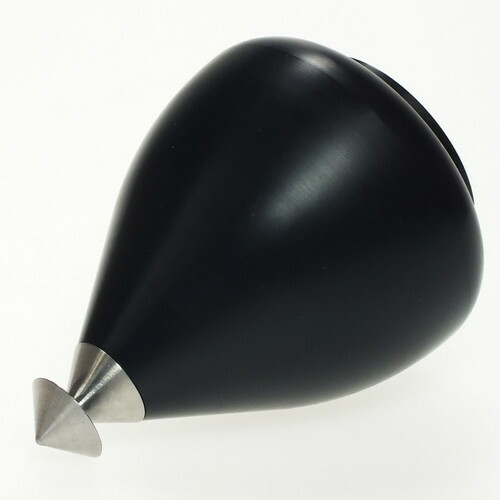 New for this year is the Venom kendama, which appears to be identical to the Komodo but with a different paint finish on the tama that promises to be tackier, making balance tricks like Lighthouse and Bird a bit easier. The catalog photo is just a digital mockup, and we don’t have confirmation on a retail price or availability yet. but the Venom is actually shipping to retailers now with a retail price of around $24.99. We’ve already seen the Echo 2, a revamped version of the ill-recieved Echo from a few years back. The Echo 2 seems to very much right the wrongs of its predecessor, and is quickly becoming a 1A favorite among Duncan’s sponsored team. But new for a US release is the Torque, a re-branded version of Duncan’s metal “Torquave” yoyo created for Bandai’s Hyper YoYo campaign. We’re guessing the specs are the same; 55mm diameter, 43mm width, and weighing in at 66 grams with Duncan’s large bearing setup. The Torquave was scheduled for a February 2014 release in Japan but if Duncan is releasing it here…does that mean that Bandai will not be releasing it themselves? The Torque/Torquave is a new design that we assume was created specifically for Bandai and they have a history of preferring that their exclusives stay exclusive. The Torque photos are also just digital renders…so if this was already supposed to be ready to release in Japan in just a few days and Duncan didn’t have samples for photography in time for their catalog, it’s quite possible this product isn’t even ready yet, and the launch isn’t going to happen at all in Japan. Mysteries! UPDATED INFO: The Torquave IS still being released in Japan, production is currently underway, and the catalog photos of the Torque are actual product photos that were only digitally colored. No more mysteries! Duncan has three new plastic performance yoyos coming this summer, two for 1A and a new offstring yoyo. 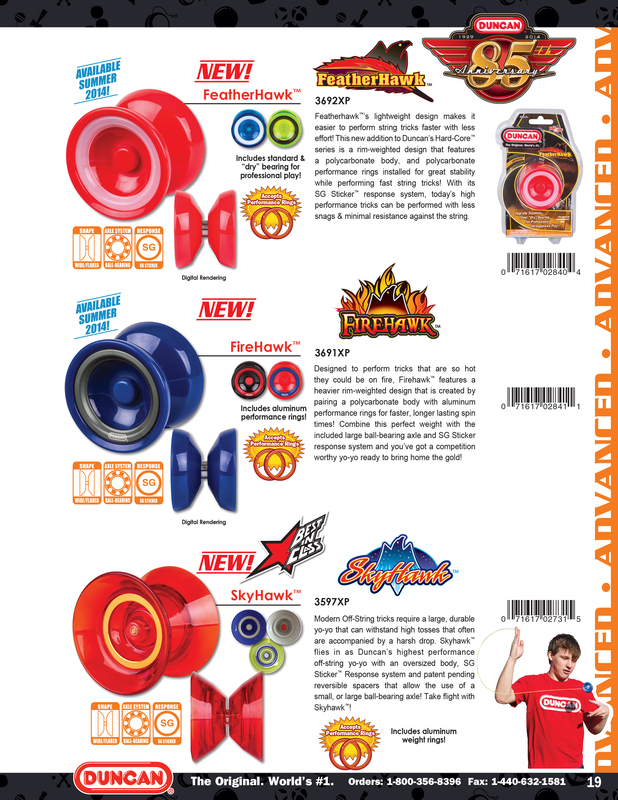 The Featherhawk and Firehawk are identical yoyos, just with different weight rings; the Featherhawk comes with Duncan’s new plastic Performance Rings, while the Firehawk comes stock with metal Performance Rings. The Skyhawk is the new offstring yoyo, and comes stock with the metal Performance Rings. Offstring seems like a pretty small category for Duncan to need to produce another specialty yoyo for, especially since they don’t really do much to promote the style of play. But maybe this one will turn out to be more to the players’ liking than the Hayabusa which was good but never seemed to gain much traction outside of Duncan’s sponsored team. 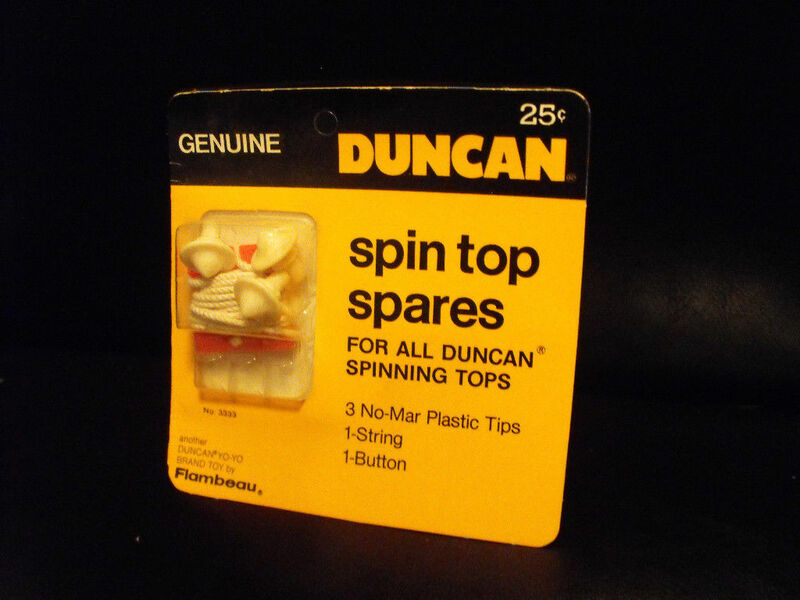 Duncan’s Performance Rings were first shown at last year’s International Toy Fair, although Duncan never did manage to actually produce and ship them. Hopefully they, along with these Hawk yoyos, don’t suffer the same fate this year. And finally we have a better look at Duncan’s new Performance Rings, as well as two new versions of their Mod Spacers. 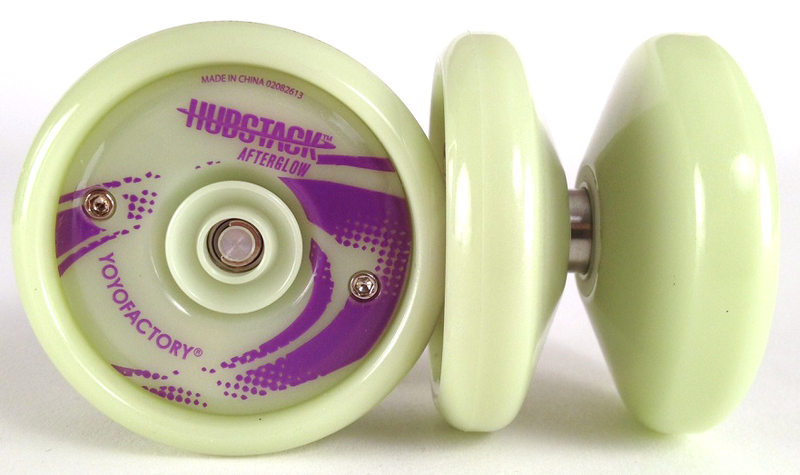 The Mod Spacers were originally developed as part of the Pro-Z yoyo, making it a “convertible” model from standard shape to Butterfly shape. 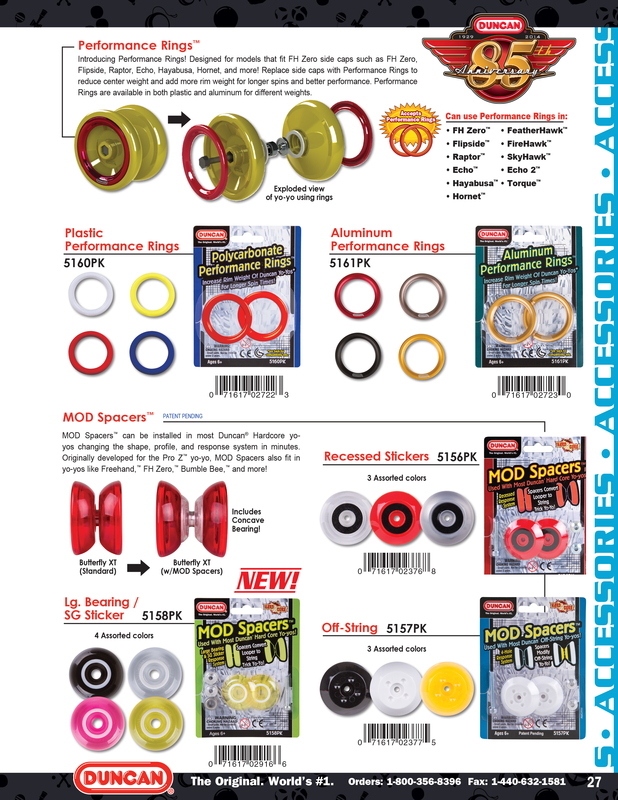 Mod Spacers offer an option for players to refresh their existing Duncan products, especially now that Duncan is offering Mod Spacers designed for offstring play, as well as another set that converts your Duncan yoyo for use with a large bearing. Since Duncan hasn’t updated the bearing and response setups of most of their plastic yoyos, the Mod Spacers can serve as a welcome upgrade for players who enjoy the brand but are frustrated with some of the outdated designs. All in all, looks like Duncan has a lot to offer at the 2014 International Toy Fair, although some of these products were shown last year and never materialized and the Hawk series and Torque are all just digital mockups. The licensed items are available now (Despicable Me 2) or hopefully very soon (Hello Kitty) and the Venom kendama will likely be available in just a couple of months…but with a “Summer 2014” release mentioned for the Torque, Hawk series, and the Performance Rings, it’s possible that we won’t see them until Fall/Winter 2014.